As the fall harvest comes to a close and winter starts to set in, you might see more fields of green than in years past as you drive around the watershed. This year CRWP is partnering with 15 farmers to help them experiment with incorporating cover crops into their operations. The farmers have planted 710 acres to cover crops with CRWP’s support. A cereal rye cover crop grows well in November after corn harvest. Cover crops are plants that are planted between cash crop seasons to keep living cover on the landscape. In our area, cover crops are normally established in the fall and keep the soil covered for the 5 – 7 months after the fall harvest and before the next spring planting of crops. Examples of cover crops include rye, oats, clovers, and radishes. Helping protect water quality by reducing erosion and trapping excess nitrogen, keeping it from leaching into groundwater or running off into surface water. Increasing organic matter in the soil and improving overall soil health by adding living roots to the soil during more months of the year. Providing livestock producers with additional grazing or haying opportunities. Providing winter food and cover for birds and other wildlife. During the growing season, cover crops can provide food for pollinators. 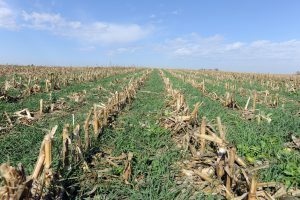 Although we know the benefits from planting cover crops, this new method comes with some challenges as well. Farmers in our area are still learning about the best method and timing to seed cover crops, especially in corn fields, and whether the cost of cover crop seed pays for itself in the benefits it provides to the farm. This year’s cover crop projects will start to answer these questions and hopefully spark an interest in cover crops from even more farmers in the watershed. United States Department of Agriculture, Natural Resources Conservation Service. Unlock your farm’s potential. Discover the Cover.